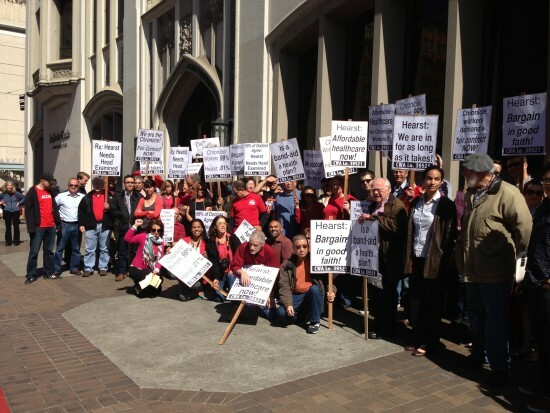 Yesterday Chronicle guild members took a walk-about on their break-time to discuss Hearst’s offer to increase the costs of their family health care. At least the sun was shining. Photo by Gloria LaRiva 2013.
resumed for a new Guild contract at the San Francisco Chronicle. unreasonable cost increases in the last two years of a four-year labor agreement. show its best offer very soon or it risks an escalating labor dispute in San Francisco. profit-sharing, union workers resent being told that we must sacrifice yet again. shown little regard for meeting either of those goals. campaign on Twitter and Facebook demanding fair terms on health care and pay. Mission wearing red and carrying placards. to suffer a pay cut or sacrifice the health coverage needed by our families? “You’re wasting time,” said one Hearst representative. Autumn Grace and Carl Hall.